Indian Event Trends | Entire Productions, Inc.
, our friend and colleague Ranjan Dey has long been a part of the special event industry catering Indian weddings. As the star of documentary series "
", we feel so lucky to rub elbows with a celebrity chef and Indian spice expert. On November 20th he graciously shared his knowledge about the niche market of Indian weddings and events. “Indian Event Trends” took place at City Hall, showcasing local vendors who can help supply a beautiful Indian- themed event leading guests through the venue progressively as they experienced the vendors’ décor, refreshments, and entertainment. The evening kicked off with an informative speech from Ranjan in the North Light Court about commonly used spices in Indian cuisine and gave several tips on how to connect with an Indian client. Guests were then guided to the South Light Court where a Henna Party was taking place – including a ghost chili eating competition (for those brave enough to volunteer), henna tattoo artists, passed hors d’oeuvres, and two photo booths. 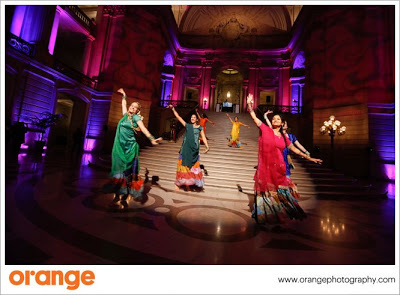 The event concluded with colorful Bollywood dancers emerging down the steps of the Rotunda to perform an upbeat number. The dancers even taught the guests how to shake their hips along to the beat! We were honored when Ranjan asked us to light the gorgeous Rotunda for this event. With pattern washes, uplights and a spotlight for the dancers’ performance, we helped to create a striking entrance as guests arrived. Among fellow sponsors Denon & Doyle Entertainment, Orange Photography, Blueprint Studios, Classic Party Rentals, and Henna Garden, we were proud to be a part of such an exciting and unique event! 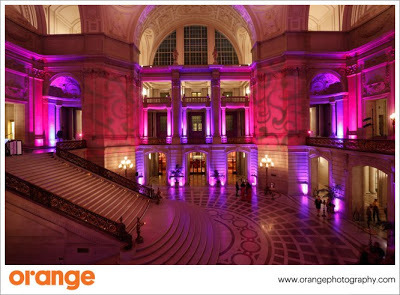 Special thanks to the venue sponsor, San Francisco City Hall and Elsie McAteer for hosting us - what a great setting!